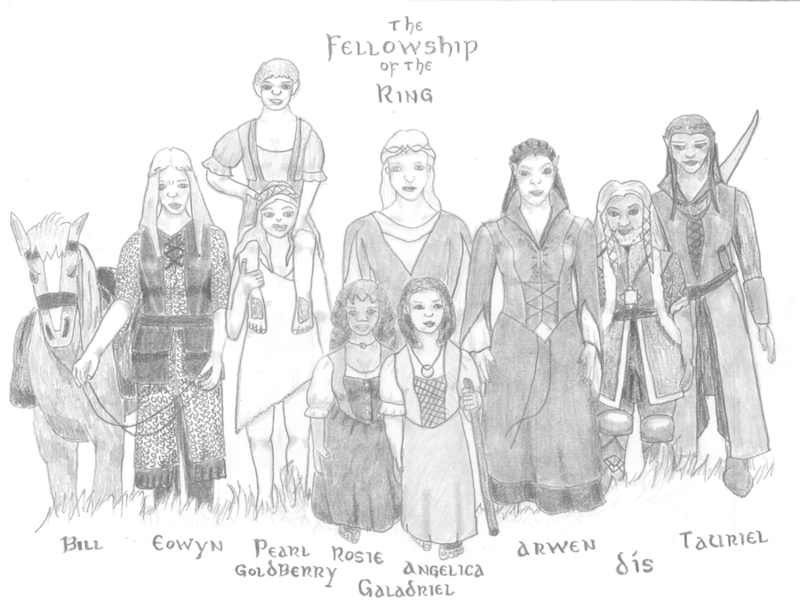 It has oft been remarked on that there are no women in the Fellowship of the Ring, and in fact very few women with actual screen-time in the Lord of the Rings. Because of this, most fanfic which adds a female Walker creates an original character for the purpose, to greater or lesser success. But... with a world as rich as Middle-earth, surely it's possible to get a woman from the books into the Fellowship. If you allow Movieverse influences, it's almost trivial - Arwen is just as much a lowercase-r ranger as Aragorn. But... surely it can't be possible to get nine in there? To replace the entire Fellowship with women? I mean, obviously it can. If they wanted, a fanfic writer could stick Luthien, Varda, Ungoliant, and Elfhild in and just tell canon to lump it. But can it be done reasonably - with only one or two points of divergence from the source material? Important note: This outline is Movieverse. Several of the women on this list draw their characterisation from the movies, not the books. When the movie doesn't mention something, I assume LotR is accurate. The Great Storm of 3018 forms in the White Mountains. It sweeps north across Rohan, wreaking havok - and causing the horse ridden by one Boromir, son of Denethor, to rear in panic. Boromir falls, breaking his sword-arm, and his horse bolts. Two days later, Boromir is found by the Riders of Rohan, weak from exposure. He is taken to Edoras in a fever, babbling about the important message he has to bear to the Elves - but King Theoden, already influenced by Saruman, doesn't care. His younger relatives are more interested. Eowyn, tending the feverish Gondorian, listens to him recite the poem that has sent him on his quest, and tells her brother and cousin about it. Theodred and Eomer both say that they should carry the message now that Boromir is incapacitated, and in fact have quite a childish squabble on the subject. When they finally stop arguing, it's to discover that Eowyn is gone - and so is her horse. Eowyn doesn't really understand Boromir's poem. She has no idea where Imladris is, or what the Sword is all about, and has only the vaguest notion who Isildur was. But there's one thing she does know: if Boromir wanted Elves, there's a whole spooky forest of them just off the northern border. The Great Storm, gathering strength, passes through southern Mirkwood, sending the Great Spiders swarming northward. They run headlong into parties of elves out hunting for the fugitive Gollum, ending the search early as Thranduil's folk turn to fight the invasion. Having failed in his task, Thranduil resolves to send a messenger to Rivendell - but the woods are far too dangerous for a single messenger. Mindful of his limited strength, he sends two - his son Legolas, and the warrior Tauriel. Meanwhile, Eowyn has reached Lothlorien, and been greeted by Galadriel and Celeborn. When she passes her message on, Galadriel is able to tell her that it needs to be taken to Rivendell, west of the Mountains - and that it should probably be considered business for the White Council (or what's left of it). Therefore, since Eowyn insists on carrying the message to its destination (she has to do her duty, you see), Galadriel will accompany her to the House of Elrond. The Great Storm crosses the mountains and sweeps west towards the Sea. It reaches the Shire late in the month, just in time to catch Frodo and Sam leaving Bag End. Not wanting to spend the night out in a gale, the pair retreat to the Green Dragon inn, where Rosie Cotton is the barmaid. Rosie is understandably curious about why Sam is out with his master on such a night. Sam tries to keep the secret, but does let slip that they're heading for Bree, with a hint that they may be going further. After the pair leave in the morning, Rosie goes to meet some of her friends. There are very few Hobbit-lasses in this timeframe who exist as anything other than names, but there are two who stand out: Angelica Baggins, Bilbo's vain niece, and Pearl Took, Pippin's sister, who couldn't possibly have murdered Lalia the Fat, because there are no criminals in the Shire you know. ^_~ Regardless, Pearl would be something of an outcast by this time, and as a Took might well have visited Bree in the past. With Rosie worried about Sam, and Angelica getting the idea in her head that Frodo might be going to find Uncle Bilbo, the three hatch a plan to head to Bree themselves and catch up with the lads. Delayed by a day or so by the Storm, Frodo and Sam never meet Merry and Pippin in Farmer Maggot's fields. After several encounters with Black Riders, they manage to make their way to Bree - only to find the ladies already there. The five Hobbits make a great deal of noise, and sure enough, Frodo manages to 'accidentally' slip on the Ring (the klutz). Aragorn is understandably aggravated, but still does his best to keep all of the Hobbits safe. It doesn't quite work. In a mirror of the book's events, Pearl slips away and manages to get herself attacked by the Ringwraiths, coming away with a nasty dose of the Black Breath. In the morning, Aragorn does his best to tend to her, but the fields around Bree have been extensively weeded, and there is no Kingsfoil to be found. Luckily, Aragorn knows the area, and leads the Hobbits west - into the Old Forest. Athelas doesn't actually grow in the Forest, but there is something even better: Goldberry, the River-Daughter of the Withywindle. (Also her bizarre singing husband, but who cares about him?) She is able to tend Pearl's malady, but she can't fully cure her - that's a job for the elves. As luck would have it, Frodo needs to go to Rivendell anyway, so Pearl (and the other ladies) can tag along. But Pearl still isn't well, and so Goldberry - who most certainly will 'pass the borders' when needed - tags along to nurse her. We follow the movie plot for a little while, through to Frodo getting attacked on Weathertop, and Aragorn looking for Athelas to heal him. But Pearl's condition has been aggravated by her proximity to the Ringwraiths, so when Arwen shows up she has two Hobbits to carry with her. She does, just, make it safely across the Ford. But the extra time was too much for Frodo, and by the time he reaches Rivendell, Elrond and Gandalf can do nothing to save him. The Council of Elrond is a sombre business. A tearful Sam is invited, to tell the story of the Ring's departure from the Shire. Pearl is also present, due to her encounters with the Nazgul, while Rosie and Angelica watch from afar. Eowyn brings her message, Tauriel sits next to Legolas, and Galadriel is given a place of honour. Goldberry is in the Council too, sitting alongside Arwen (who can't really be excluded when her grandmother is present). Gloin and Gimli are there too, but they aren't the only dwarves - the company returning from the Blue Mountains has wound up in Rivendell at this time, and among them is the elderly (~258) Dis, mother of Fili and Kili. Dwarven women usually stay out of sight - but Dis has heard that the elf-woman her son Kili loved is present, and no power on earth can stop her attending. My feeling is that Pearl is probably the one to claim the Ring ('Frodo and I both took a black wound; if I am the one who survived, then I should take up his burden'), but it could be Angelica if Bilbo pulls his book-stunt of trying to carry it himself (she would insist that she would take it instead). Either way, Rosie insists on going with them (she is after all the reason they're there), and the other Hobbit joins up too. Eowyn... well, it's hard to see how they could keep her out, after she's come all this way. And while Gandalf no doubt tries to step in as guide, Galadriel says fairly pointedly that 'this is a task for silent waters, not the flames of Anor', and takes on the post of guide for herself. Nine companions have come together, bearing the fate of all Middle-earth - and all because of a simple, though possibly malignly-created, storm. I notice the geography is somewhat flexible. Are you sure you didn't take any inspiration from the Game of Thrones series? Another point - with such a collection of female macho, how on earth to the Nazgul even live long enough to reach the Pelennor? Hey, this is the Movieverse - I'm not even sure Buckland exists, let alone how far it is to the Brandywine Bridge! A few minor tweaks and a storm that lives two months and wanders across an entire continent are a small price to pay. You have to wonder just how dense the Witch-King was. 'Not by the hand of man will he fall', says Glorfindel, but whether that's a lowercase or capital M, there are thousands of ways for him to die regardless. Heck, per TH:B5M, he actually faced Galadriel herself at Dol Guldur. Did he never go 'hey, girls with swords, better watch out for them'? Actually, I realise in hindsight that this is a perfect Nazgul-killing group, because no less than three of them are (if you'll pardon the term) some form of water-mage. Movie!Arwen of course summoned a flood down the Bruinen; Galadriel is sporting the Ring of Water; and Goldberry is the River-Woman's Daughter. Between them, they're perfectly positioned to send the Nine scurrying 'unhorsed and unmasked' back to Mordor any time they run into them by a river. Not perfect, but fun to do.